As we mentioned in our last blog, Site U1520 sits at the base of Tūranganui Knoll. This is an isolated seamount which rises almost 900 m, from a depth of 3600m to 2740m. It is sitting on the margin of the Hikurangi Plateau approximately 100km east south-east of Gisborne. 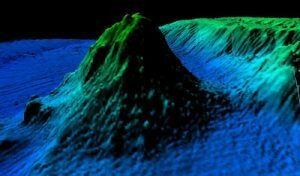 Seamounts are typically formed from extinct volcanoes that rise abruptly and are commonly found in marine environments and subduction zones. They often support healthy fisheries because they provide a rich marine ecosystem attracting plankton, corals, fish, and marine mammals alike. They are found all around the world in the ocean and follow a distinctive evolutionary pattern of eruption, build-up, subsidence and erosion. We have seen pipers here (species tbc! – some type of skinny silver bait fish), small squid and a pod of pilot whales, so perhaps they are feeding in this rich area. How do they affect the Hikurangi Subduction Zone and the East Coast? Coring into the base of this seamount might help us answer this. We want to know what material it is made of, and what might happen when it is dragged westward into the subduction zone. As the seamount ages, the possibility of one side (flank) of it collapsing increases, and this has been suggested to cause landslides that have the potential to generate massive tsunamis. 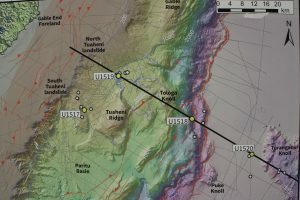 Research by Bell et al (2014) suggest that the 1947 Poverty Bay and Tolaga Bay earthquakes were caused by subducting seamounts. This is based on the idea that the seamounts are stronger than the surrounding layers of sediment filling in around them, and form patches along the subduction fault that are more likely to stick, build up stress, and then slip suddenly.The two earthquakes in 1947 caused only very mild shaking on land, but produced significant tsunami up to 10 m high that damaged houses and infrastructure north of Gisborne. Earthquakes of this type are called “tsunami earthquakes” – moderate earthquakes that do not cause violent shaking but often last more than a minute and produce anomalously large tsunami. 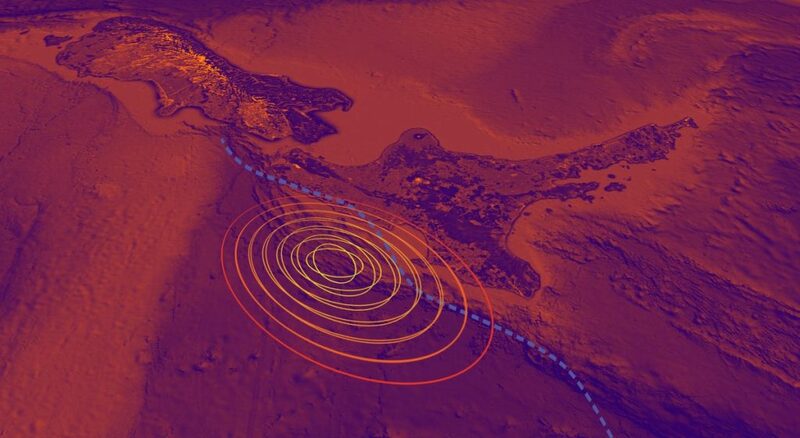 We are interested to understand how the seamount relates to slow slip and tsunami earthquake events here in the northern Hikurangi subduction zone region. Because seamounts are in a dynamic ocean setting (more so than volcanoes on land) they may sink down and ‘bulldoze’ into the subduction zone. As they are dragged into the zone they may leave evidence of their passage by carving indentations into the ‘hanging wall’ of the subduction fault. As they subduct and disrupt the material above, they may also generate a broad “channel” of damaged rock, and also draw in sediment in front and around them into the subduction zone. This wide zone of fluid-rick sediment and damaged rock may be one factor causing slow slip earthquakes.